1-866-492-5532. Our lines are open from 10:00 a.m. to 6:00 p.m. PST, seven days a week. For specific customer-service questions about your orchids and any orchid-related product, please call 1-415-567-2443 Monday through Saturday from 11:00 a.m. to 7:00 p.m. PST. Beautiful Orchids Home and Orchid Gallery is open Monday-Friday: 11:00 a.m to 5:00 p.m; and Saturday: 11:00 a.m. to 4:00 p.m.; we are closed on Sunday. Our gallery is located in the Presidio Heights district - 3319 Sacramento Street (Presidio & Walnut), San Francisco, CA 94118. You can also e-mail your product or customer-service questions to us at customerservice@beautifulorchids.com. We will try to help you as quickly as possible, but we regret that questions and comments unrelated to your order cannot be answered through this e-mail address. Beautiful Orchids offers an extensive variety of both potted and freshly cut orchids for the beginning enthusiast and the experienced collector. We guarantee the quality of each orchid shipped. If an item falls below your expectations, simply return it and we will gladly replace it, exchange it for another selection, or refund your paymentno questions asked. 1. 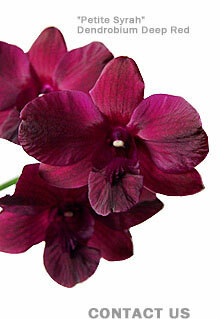 Beautiful Orchids accepts Visa, MasterCard, Discover and American Express cards. 2. To place an order, select the orchids, exotic flowers and accessories you would like to purchase from the Beautiful Orchids pages using the pull-down menus. 3. Choose the appropriate quantity, shipping method and accessories (if applicable). Please indicate whether a substitution of equal or greater value is acceptable if your chosen item is unavailable at that time. 4. Click on the "Buy" button to view the contents of your shopping cart. 5. Choose “Continue to Shop” to add items to your shopping cart. 6. Click “Check Out Now” to begin purchasing. 7. Fill in your shipping and billing information, as directed. 8. Click on “Submit Secure Order” to finalize your purchase. 9. You will receive an initial e-mail confirming your purchase, as well as a second e-mail to confirm that your items have shipped. Your credit card will not be charged until your order ships. Beautiful Orchids.com can fill orders within the United States only. All potted orchids are grown, inspected, and packed in the state of California. All freshly cut orchids and other exotic flowers are shipped to and inspected at the Port of San Francisco. For other special shipping instructions, or any questions you might have, please e-mail us at contactus@beautifulorchids.com.